Kasich calls House GOP health plan "inadequate"
Ohio Gov. John Kasich doesn't like the emerging GOP Obamacare repeal and replacement plan, he told reporters after his meeting with President Trump on Friday. "I just told him it was inadequate," he said after being asked about the tax credit in the plan. A draft bill obtained by Politico showed the tax credit varies by age, giving $2,000 a year to those under 30 and then eventually doubling to $4,000 for those 60 and above. 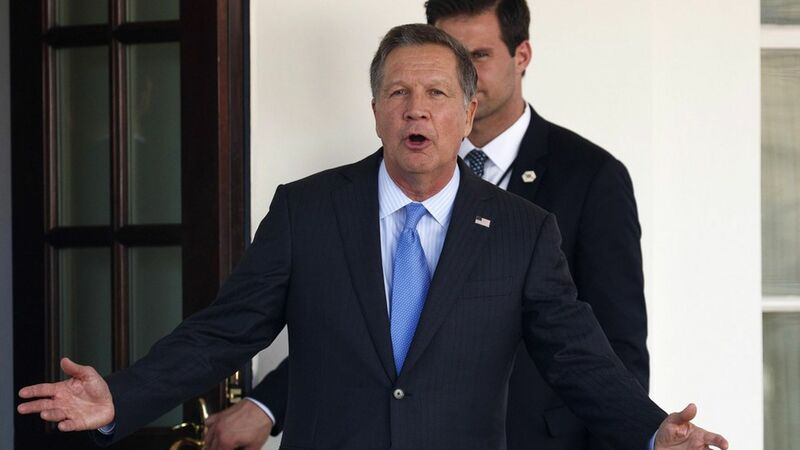 When a reporter began to ask if Kasich disagreed, he cut in, "Completely, isn't that clear?" Why this matters: Now it's not just liberals saying the GOP plan falls short in terms of how much it helps people afford their health coverage. While Republicans have already been fracturing over how to move forward with repeal and replacement, details of the plan will probably only deepen the divide.